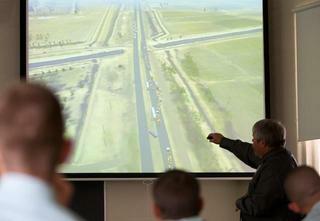 Chris King points to a virtual battlefield depicting a convoy under attack during a virtual staff ride at the George C. Marshall Awards and Leadership Seminar, Tuesday. •The George C. Marshall Seminar honors the top 273 Army ROTC Cadets from across the nation. LEXINGTON, Va., April 20, 2011 -- Army ROTC cadets at the George C. Marshall Awards and Leadership Seminar took a trip through time and distance to a battlefield in Iraq. Through technology, the cadets were transported more than 6,000 miles and six years to an ambush on Palm Sunday 2005 near Baghdad. They stood on rooftops insurgents used to fire on American Soldiers and civilian truck drivers. They sat in the driver's seat of a truck hit by the insurgents' rocket-propelled grenades. They ran down a trench beside a 10-foot berm that offered cover from enemy fire. All of this they accomplished while sitting in their desks on the campus of Washington and Lee University during a virtual staff ride, where the battle was reconstructed on a granular level of detail. "It's easy to go to Gettysburg," said Curtis King, an instructor at the Combat Studies Institute with the Combined Arms Center at Fort Leavenworth, Kan., who facilitated the simulation. "But it's not easy to visit Afghanistan. "It's nice to do a staff ride without getting shot at," he said. The session was patterned after a traditional staff ride, except that instead of driving over the actual terrain, it was reconstructed in 3D on a computer screen almost exactly, down to the buildings and hills. The session was divided into three parts. The first phase, or preliminary study, laid out the conditions around Baghdad with the rising insurgency and increasing attacks on convoys in the early part of 2005. King walked the students through the different supply routes and units involved. During the second phase, or field phase, King zoomed the point of view around the battlefield as the battle progressed, following the trucks and Humvees through the action, discussing the actions of specific Soldiers who took part in the battle. At one point, footage an Australian convoy driver had filmed during the attack was played. The third phase, or integration phase, focused on lessons learned from the scenario. Decisions Soldiers made were dissected and discussed. King explained the point of a staff ride is to look at the terrain and how it affected an engagement. To reconstruct the ambush took about a year and was formed by reviewing official accounts of the conflict, interviewing those involved and piecing together photographs and satellite imagery to reconstruct the terrain. For this one battle, King estimated his institute took about a year to put the virtual ride together. For cadets at the Marshall seminar, the opportunity to dissect a real-life battle and virtually walk the battlefield made an impression. Peter Rogers, a cadet from the University of Southern Mississippi, had gone along on a real staff ride before, but said the virtual version was impressive. "It's an awesome experience, especially the terrain," Rogers said. "It's the difference between hearing the story and seeing the action."